Pullbox Reviews The Lone Ranger/Green Hornet #1 (of 6)- Two generations from the Thrilling Days of Yesteryear! A tale of super-heroics and family that has taken eighty years to be told! This first chapter, entitled “Those Thrilling Days of Yesteryear,” creates a world of carefully researched alternative history in 1936 as we learn whatever happened to The Lone Ranger and discover his familial link to the emergence of a man who is a modern day urban version of The Lone Ranger himself. What is the blood connection of The Green Hornet to The Lone Ranger? What is the link of Olympic runner Jesse Owens to The Green Hornet? What role does Bat Masterson play in The Lone Ranger’s New York adventure? What intense rift tears a family apart just when America desperately needs a great champion of justice? The shocking answers lie in the historic first issue of “The Lone Ranger Meets the Green Hornet: Champions of Justice! Newspaper tycoon Dan Reid has a problem. His son, Brit, seems to be adrift, wandering the world in search of himself instead of taking an interest in the operation of the Daily Sentinel. Feeling a little lost, Dan goes to his elderly Uncle John, a retired old cowboy who spends his days telling stories to local kids. These tales of the Old West, a fiery horse with the speed of light, and a daring masked rider of the plains, never cease to entertain and inspire. Interestingly, the stories are looked on by listeners as tall tales told by an old retired lawman, but Dan knows the truth behind them. Not only is Dan Reid aware of his uncle’s life as the Lone Ranger, but he’s also spent some time in his youth riding alongside the cowboy and his friend Tonto. That fact makes his son’s aimless roaming, from Kenya to China, so much more frustrating. Unbeknownst to either of the elder Reids (but knownst to us), the younger Reid’s travels aren’t taking him on a path to self-discovery, but on a path to his own life as the masked defender of justice… the Green Hornet! As his granduncle John considers how best to approach Reid the younger, Brit is having his own crisis of faith. Speaking with his friend and companion Kato, Brit is trying to reconcile his respect of the law with the obvious corruption running rampant through the city of Chicago. Just as Kato breaches the subject of another path, a third option between the law and the criminal element, Uncle John steps out of the shadows to weigh in with his own advice. It’s no secret that I’m a huge fan of the old pulp action heroes, so any title I see that includes the name Green Hornet or Lone Ranger (or Doc Savage, the Shadow, the Phantom, etc) immediately gets my attention for a look. There’s something about these old fashioned doers of good and defenders of the innocent that still rings my fanboy bell, no matter how dated the original material might be. In a very real sense, our heroes are the modern day equivalent to mythology. We just replaced stories of Hercules and Odysseus told around a cooking fire to stories of more modern embodiments of courage and might. At first we did it in voice acted radio dramas, then in pulp novels, and then on to comic books. 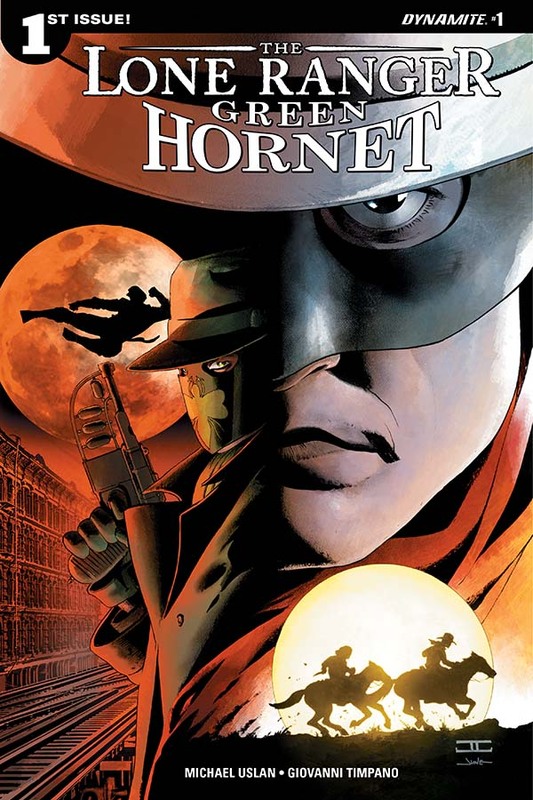 What I really like about Dynamite taking on this series, aside from the obvious “it’s the Lone Ranger AND the Green Hornet!” is that the blood relationship between the Lone Ranger and the Green Hornet isn’t one that’s widely known. It goes all the way back to the old radio dramas, both written by Francis Striker for radio station WXYZ out of Detroit. Granted, the relationship was never outright labeled, but there have been enough hints dropped throughout the history of these characters to make it a pretty easy leap of logic. The aspect of this relationship has never been played out like this though. What makes this story stand alone is that we have a passing of the torch, from one generation to the next, one legend to another. Dynamite’s done a great job of keeping the old pulp heroes alive and going strong, and the creative team of Michael Uslan, Giovanni Timpano, and Pete Pantazis looks to be on pace to keep that record running. So return with us now, to those thrilling days of yesteryear as thundering hooves and a cloud of dust combine with the Hornet’s sting.